Combine all ingredients in a blender, blend until smooth. Refrigerate until ready to use. In a food processer combine the almonds and parmesan cheese, pulse until wet sand-like consistency. Place in a flat vessel. Roll the diced avocado pieces in almond parmesan crumble. Hold in refrigerator until use. Combine the 2 cups kale, ½ cup Brussels sprouts, ½ cup broccoli slaw, and ¼ cup dressing in a bowl, toss to coat completely. Place in a serving bowl. 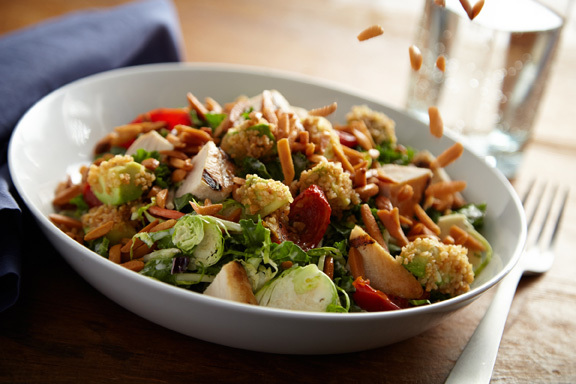 Top with ¼ cup oven roasted tomatoes, ½ cup diced chicken, 2 tablespoons honey roasted almonds, and ½ cup avocado croutons. Serve immediately.